Coastal managers and decision-makers are faced with the new challenge of designing conservation and restoration strategies that will enable valued coastal resources to prove resilient in the face of climate change. They need restoration planning tools, based on robust science that will help them design effective strategies. Critical questions include (1) what is the role of climate-related stressors in impacting critical resources relative to other existing anthropogenic stressors, (2) how will climate-related stressors interact with other anthropogenic stressors, and (3) what is the role of local adaptation and population connectivity in resilience to climate change? We are addressing these questions for native Olympia oysters (Ostrea lurida) in Pacific coast estuaries. We are taking a collaborative, joint fact-finding approach, involving restoration practitioners and resource managers in the development and implementation of the research, and developing relevant products for users. 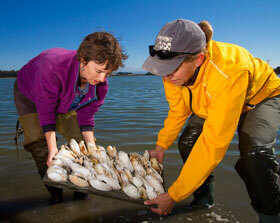 The ultimate goal of “Managing for resilience in the face of climate change: a scientific approach to targeted oyster restoration in San Francisco Bay and Elkhorn Slough, California” is to increase the resilience of oyster restoration projects in the face of climate change.